John Mielke opened one of Spokane's newest breweries, Square Wheel Brewing, this month. Several others are slated to open soon. The Inland Northwest beer boom is not over, people. In fact, we might still be somewhere in the middle of it, as evidenced by the number of breweries waiting in the wings. Just weeks ago, the region saw the birth of its newest beer maker in the form of Square Wheel Brewing (pictured above), the sudsy arm of renowned winery Arbor Crest. 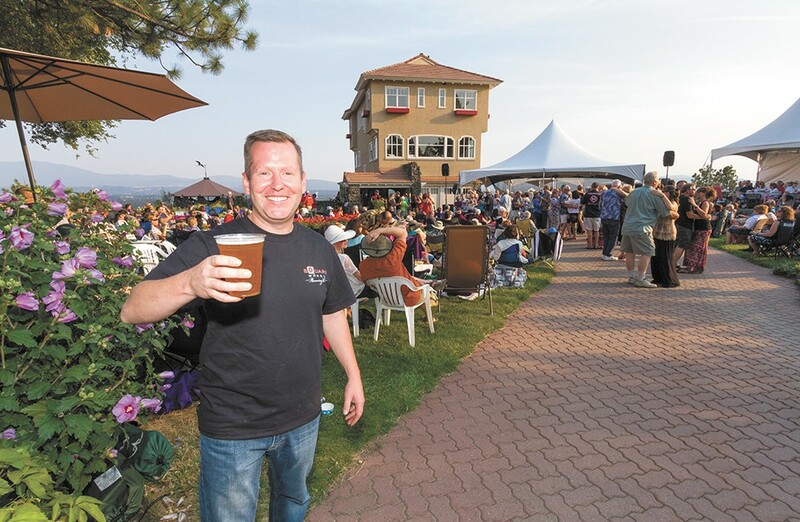 Square Wheel is starting slow by introducing their brews during concert events at Arbor Crest's scenic space. It's exciting stuff, for sure, but there's even more on the horizon. Here's a rundown of your next favorite spots to grab a pint. In Middle English, a bellwether was the leader of a flock of sheep — a ram with a bell tied around its neck. Nowadays, it refers to trendsetters, and that's what Bellwether Brewing plans to be in the Spokane beer scene. Spokane natives Thomas Croskrey and Dave Musser have known each other since elementary school. They hope their brewery will become a hangout spot with a pub vibe for folks in the Emerson-Garfield neighborhood. They'll offer standard brews like IPAs and lagers, but their specialty will be historic beers, including a braggot — a mead and malt barley blend. Young Buck Brewing is one of two breweries that will sprout from the Incubator Brewhouse, set to open in the historic Luminaria Building downtown this winter. The goal of the brewhouse, which Young Buck owner Cameron Johnson is helping create, is to give homebrewers a chance to spread their wings and eventually become full-fledged breweries. Johnson has been brewing for about six years, and now he's ready to sharpen and share his skills in the Incubator. He plans to be highly experimental — he says he won't brew the same beer twice in the first year. Expect fun variations of IPAs, imperials and wine barrel-aged sours. Little Spokane Brewing Company will be the second Incubator Brewhouse tenant, along with Young Buck Brewing. Owner Joe Potter has been a homebrewer for more than a decade and an active member of the Inland Brewers Unite group for years — he served as president for a couple of those years. In fact, the Incubator concept stemmed from conversations that occurred at IBU gatherings. With a brewing résumé that strong, we can trust there'll be some solid suds coming from this new spot, though they might not be as experimental as Incubator neighbor Young Buck's brews. Potter plans to serve up carefully crafted classics, including American takes on British styles, porters, IPAs and session beers. Patrick Sawyer and Jake Wilson began brewing on a whim four years ago when they found a 1970s home-brewing kit while cleaning out Jake's dad's garage. They fell in love with the process, and now after two years of planning, they're well on their way to opening their own brewery. The Quartzite Brewing Company is currently under construction in what used to be an auto shop in Chewelah. When it opens, it'll have a modern, urban-industrial vibe and serve all the standard brews, including ambers, IPAs and plenty of ales, though the pair plans to get more creative with their beer as they expand. "Our goal is to make people who are in Chewelah feel like they're in a city," Sawyer says.